At Northeast Stars, the Primary Classroom is a place of calm and order. Our Primary Students are ages 36 months to 5 years. Children thrive in our primary classroom because they experience learning through practical application. They work at their own pace in both a one on one and group learning environment with the guidance and encouragement of our teachers. The lead instructors are Montessori credentialed and plan daily activities using the Montessori teaching method. This enables the children to function confidently and completely in the activities of their everyday life. Practical life: The precise movements and sequences developed doing practical activities such as polishing, buttoning, bow tying, and lacing strengthen motor skills and concentration. Pouring, scooping and sorting activities, as well as washing a table and food preparation develop hand-eye coordination. Other activities include lessons in polite manners, such as folding hands, sitting in a chair, and walking in line. Sensorial: The sensorial materials provide a range of activities and exercises for children to experience the natural order of the physical environment, including such attributes as size, color, shape and dimension. Many materials are pre-cursors to complex math and geometry. Examples of these materials are pink tower (series of ten sequential cubes, varying in volume); knobbed cylinders (wooden blocks with 10 depressions to fit variable sized cylinders); broad stairs (ten wooden blocks, sequentially varying in two dimensions); color tablets (colored objects for matching pairs or grading shapes of color). Mathematics: In this area, materials are provided to show such basic concepts as numeration, place value, addition, subtraction, division and multiplication. For numeration, there is a set of ten rods, with segments colored red and blue and “spindle boxes,” which consist of placing sets of objects in groups, 1–10, into separate compartments. For learning the numeral symbols, there is a set of sandpaper numerals, 1–9. For learning addition, subtraction, and place value, materials provide decimal representation of 1, 10, 100, etc., in various shapes made of beads, plastic, or wood. Beyond the basic math materials, there are materials to show the concept of fraction, geometrical relationships and algebra, such as the binomial and trinomial theorems. Language: Montessori language materials provide experiences to develop use of a writing instrument and the basic skills of reading a written language. For writing skill development, the metal insets provide essential exercises to guide the child’s hand in following different outline shapes while using a pencil or pen. For reading, a set of individual letters, commonly known as sandpaper letters, provide the basic means for associating the individual letter symbols with their corresponding phonetic sounds. Displaying several letters guides children to learn the letter sounds, which finally blend together to make certain simple phonetic words like “up” and “cat.” The purpose of the lessons is to teach the child that letters make sounds, which can be blended together to make words. Cultural Studies: The world’s geography and people are explored through such materials as maps, globes, flags, water and landforms, books, and cultural suitcases containing country-specific materials. Integrated Art and Music: The arts are incorporated into daily classroom activities from painting and creating sculptures from basic craft materials, to studying origins and expressions of music through listening, playing and performing. Science: The children conduct and observe various experiments with simple equipment. They learn to identify and classify. The preschool curriculum includes work in zoology, biology, and botany. A study comparing outcomes of children at a public inner-city Montessori school with children who attended traditional preschools indicates that Montessori education leads to children with better social and academic skills. 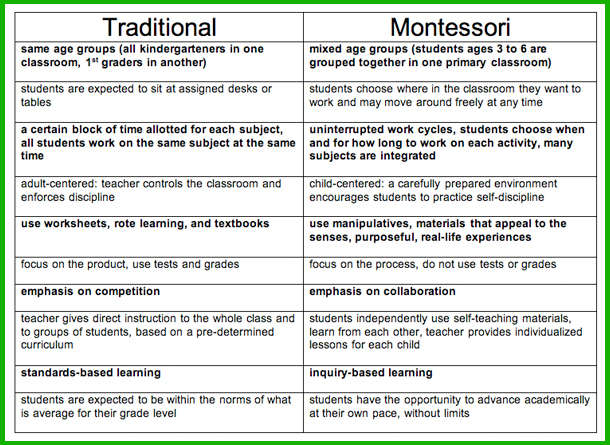 Montessori education is characterized by multi-age classrooms, a special set of educational materials, student-chosen work in long time blocks, a collaborative environment with student mentors, absence of grades and tests, and individual and small group instruction in academic and social skills. The Montessori school studied is located in Milwaukee and serves urban minority children. Students at the school were selected for enrollment through a random lottery process. Those students who "won" the lottery and enrolled at the Montessori school made up the study group. A control group was made up of children who had "lost" the lottery and were therefore enrolled in other schools using traditional methods. In both cases the parents had entered their children in the school lottery with the hope of gaining enrollment in the Montessori school. "This strategy addressed the concern that parents who seek to enroll their children in a Montessori school are different from parents who do not," wrote study authors Angeline Lillard, a University of Virginia professor of psychology, and Nicole Else-Quest, a former graduate student in psychology at the University of Wisconsin. This was an important factor because parents generally are the dominant influence on child outcomes. The children who attended the Montessori school, and the children who did not, were tested for their cognitive and academic skills, and for their social and behavioural skills. "We found significant advantages for the Montessori students in these tests for both age groups," Lillard said. "Particularly remarkable are the positive social effects of Montessori education. Typically the home environment overwhelms all other influences in that area." Among the 5-year-olds, Montessori students proved to be significantly better prepared for elementary school in reading and math skills than the non-Montessori children. They also tested better on "executive function," the ability to adapt to changing and more complex problems, an indicator of future school and life success. Montessori children also displayed better abilities on the social and behavioural tests, demonstrating a greater sense of justice and fairness. And on the playground they were much more likely to engage in emotionally positive play with peers, and less likely to engage in rough play. After school enrichment offerings are different at each campus; largely directed by parent suggestion and interest at each location. northeaststarsmontessori.nes@gmail.com to get a complete list of our updated enrichments.